Seniors Jenna Kealer and Nick Singley portray Juliet and Romeo in the famous balcony scene (Photographs courtesy of Zoraida Kerr). 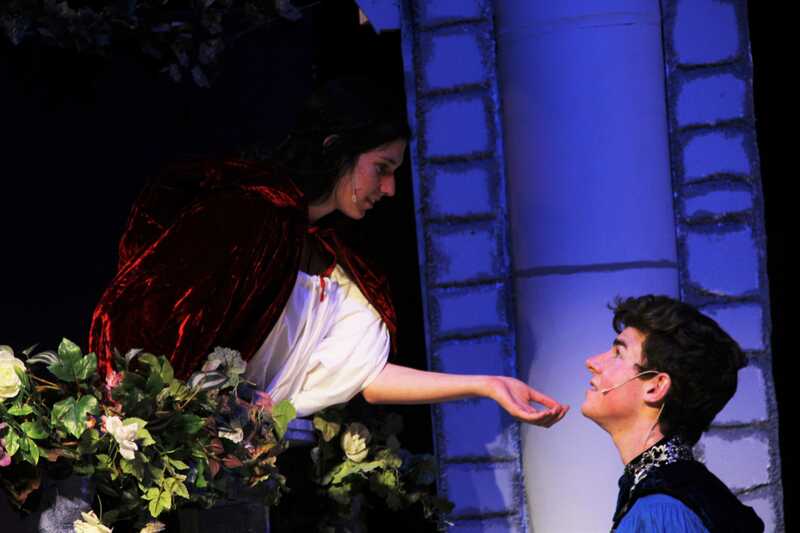 The drama department, led by Don Enoch, debuted “Romeo and Juliet” in the Pavilion Dec. 3-5. Seniors Kayla Gorenstein and Jenna Kealer portrayed Juliet Capulet, and seniors Nick Singley and Gianberto Ridino portrayed Romeo Montague. Production manager Ellyn Schneider and the stage crew created the set from Styrofoam texturing and wooden columns. “It was difficult trying to shape that foam, and it certainly took time to do it, but I’m glad that the set turned out to be pretty amazing,” stage manager and junior Sohrob Keynejad said. Oak Park Performing Arts Association member Carla Schnurr, along with a team of student artists, provided costumes (some custom made), hair and makeup for the show. Carl Schnurr, a formal professional fencer, choreographed sword fights for the students. “It was so much fun to work with those swords and I’m glad they took risks with it; otherwise the show wouldn’t feel complete,” drama department member and senior John Duffy, who played Mercutio, said. Senior Holland Ryser, who attended the Saturday night showing of “Romeo and Juliet,” enjoyed the show. “It was an amazing show and the actors really captivated your attention. Even when it seems to get boring at times, it picks back up,” Ryser said.